In the science of attention-getting, imprecise though it may be, there are two schools of thought: the flashy (blinking neon lights, plunging necklines, Damien Hirst) and the ferociously minimalistic (an “Open” sign, a string of pearls, Jasper Johns). Drink, a bar recently opened in Fort Point, a longtime sedate, warehouse-lined area of South Boston, embraces the latter. With expansive ceiling beams, vestiges of the building’s late 19th-century construction, exposed brick walls devoid of televisions or art, a back bar without a single liquor bottle, and not a drink list in the house, guests perched around a meandering white oak bar are left to direct their attention to the cocktails themselves. The drinks are the night’s high-maintenance stars — but that’s not to be confused with prima donnas. 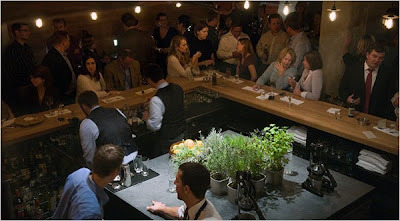 At three distinct but connected horseshoe-shape stations, bartenders lunge, pivot, chisel and thwack mallets (more on that later) while others crack ice cubes, juice citrus halves, and pluck stems and leaves from herb plants clustered on a wide prep table in the center bay.